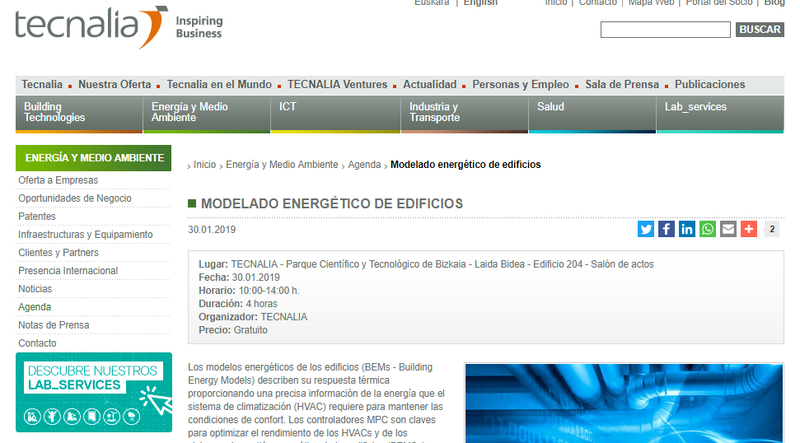 TECNALIA, coordinating Partner in MOEEBIUS Consortium, organizes inter-project workshop on energy modelling in buildings. This event, which will be held on January 30th 2019, in Derio, Spain (TECNALIA headquarters) will be organised along with other H2020 project FHP "Flexible Heat and Power, Connecting heat and power networks by harnessing the complexity in distributed thermal flexibility", where experts from TECNALIA and HONEYWELL, also MOEEBIUS Partner, are involved. Actually, there will be two workshops (one in Derio and, respectively, one in Prague, Czech Republic) in the field of building energy modelling scheduled within the framework of MOEEBIUS dissemination & communications plan. Both will be focused on the potential application in the market of diverse modelling techniques, inviting local market stakeholders such as ESCOs, HVAC manufacturers, BEMS programmers etc. The workshop in Derio will be conducted in Spanish and promoted in local media. External experts, also from the energy modelling field, representing another H2020 project - SmArt BI-directional multi eNergy gAteway (SABINA) have also been invited to participate in the event. The workshops, dedicated mainly to exploitation and solutions that will be introduced into the market, will be complementary to MOEEBIUS Final Conference, which will be held on 28th of February 2019 in Wels, Austria, in the context of World Sustainable Energy Days. We kindly invite all participants interested in MOEEBIUS core ideas, energy efficieny and green behaviour in buildings, to participate in the workshops as well as in the MOEEBIUS final event in Wels!